Basic Ingredients: Small groups of six can join Hix at the ‘Kitchen Table’ in his Lodge in Dorset and get a bird’s eye view of the well respected chef, restaurateur and cookery writer at work, whipping up a four-course lunch from the season’s best ingredients. Classes are £175 per person, start at 11.30 am and each course is paired with wine. The ‘Kitchen Table’ masterclass is also now available in London (7pm to 10.30pm) and is being run from the Bulthaup kitchen showrooms, on Clerkenwell Road, minutes from the Hix Oyster and Chop House. We say: Mark Hix has years of top flight experience and his empire is expanding so we recommend you book well in advance. Contact: To book a ‘Kitchen Table’ course in Dorset contact Augusta Adu: augusta@hixfoodetc.co.uk; For the London course contact Jo Harris on 01206 756388. Basic Ingredients: Head Chef Adam Byatt is part of the “adopt a school” programme with the Academy of Culinary Arts and regularly appears on BBC Saturday Morning Kitchen. 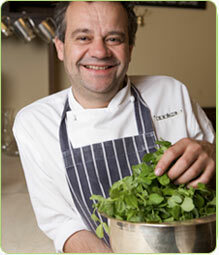 Along with Trinity’s other senior chefs he hosts ‘Thoughts for Food’ which aims to teach the fundamentals of cooking. Most classes last for 3 hours, cost from £50 per person and are a mixture of visual demonstration and verbal tuition and cover topics such as pasta making, wine tasting and dinner party entertaining. They also offer private or bespoke classes, some of which are one-on-one. We say: Join Byatt for a trip to Borough Market. Learn how best to shop for seasonal produce then retire to the relaxed environs of the Trinity dining room for lunch where you will enjoy the fruits of your labour. Basic Ingredients: With its driftwood furniture and nautical decor, the Gallivant Hotel’s Beach Bistro is the setting for an informal cookery Master Class where head chef, Bruce Wilson, shares his passion for sourcing and preparing only the finest local ingredients. All courses are priced at £125 per person and a typical day involves meeting with local suppliers and procuring the day’s ingredients, which are prepared during a three-hour class and then served as a feast. We say: Include an overnight stay at the hotel when booking a cookery class and receive a 40 per cent discount off a double room. Basic Ingredients: Book a course at Morston Hall, a gorgeous 17th-century country house hotel on the North Norfolk Coast, for a thrilling insight into how chef, Galton Blackiston’s creates dishes for his Michelin-starred restaurant. There are demonstrations that focus on fish, game or just what Blackiston likes to cook for supper! On offer are half-day demos priced at £70 per person or three-day residential courses ranging from £695 to £840 per person. We say: Save up and treat yourself to a residential course where you’ll spend a luxurious three days at Morston Hall, enjoy the coastal air and the opportunity to pester the head chef for culinary nuggets. Basic Ingredients: Paul Heathcote’s award winning Longridge Restaurant in Preston regularly plays host to foodies and budding chefs in a variety of cookery classes, which are all designed by Heathcote and taught by head chef, and Great British Menu contestant, Chris Bell. Classes are run every month of the year and suit the season, so there’s Winter Cooking, Light Summer Dishes and Cooking for Christmas to name but a few. All classes start mid-morning, are primarily on weekends and are rounded off with a three-course champagne lunch. The cookery class is priced at just £75 per person and the Longridge Tour at £95 per person. Basic Ingredients: Become ‘Chef For a Day’ at the beautifully located L’Enclume courtesy of Head Chef Simon Rogan who will start the day by inviting you to his organic farm to pick seasonal bounty for the day’s service. You’ll help out in the immaculate kitchen as orders come in, prepping ingredients alongside Rogan and his insightful team. A tour of the development kitchen is included and you’ll be served up sumptuous treats throughout the day. We say: Feed off the excitement of a head chef in love with his surroundings and dedicated to culinary innovation. Hi, i am looking to book my lovely wife on a cookery course with yourself at your earliest convenience in london please. i appreciate it is short notice but please help me out.